MOTORSPORT: Nico Rosberg is expecting to party for the next few days after emulatuing his father by winning the Formula One World Championship. The German 31-year-old finished second behind Lewis Hamilton in the final grand prix of the season at Abu Dhabi to beat the Briton to the title by five points (385 to 380). His father, Keke Rosberg won the drivers' championship in 1982 and Rosberg junior was delighted to add to the family legacy. "Two Rosbergs are world champions ... if I've got my statistics right,” Rosberg joked moments after clinching the title. "Tonight's going to be absolutely nuts,” he added. Graham Hill (1962, 1968) and Damon Hill (1996) are the only other father and son to have won the title, with Rosberg saying his father had always given support. "Every Saturday night I get a text from him: 'Pedal to the metal.' That's it,” he said. The final race was not without controversy, with Hamilton, who was pushing for a fourth title and a third in a row, disobeying team orders by slowing down to allow other drivers to close up on Rosberg. Rosberg, who needed to finish no lower than third to take the crown, held on, but said it was hard to concentrate with Sebastien Vettel close on his tail in third. "It was so intense, the race, so tough,” said Rosberg, who finished runner-up to Hamilton in the past two years. 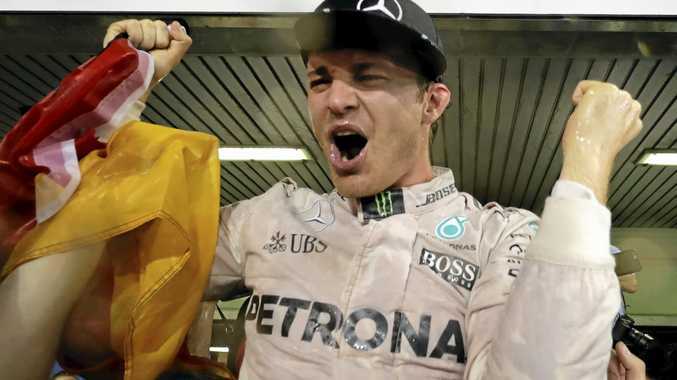 Mercedes teammates Rosberg and Hamilton have had a tense relationship but the new champion said he was proud he could finallty get one over on his rival. "It's unbelievably special to beat him because the level's so high,” he said.